The disgraced former leader of Lincolnshire County Council is being stripped of his CBE. 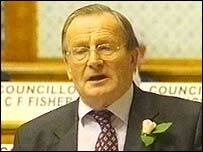 Jim Speechley, 68, was jailed for 18 months in April 2004 after being found guilty of misconduct in public office. The Conservative councillor, who was accused of trying to influence a bypass route decision, had been awarded a CBE for his public service in 1992. Speechley, now freed from jail, quit as a councillor in November after an appeal against his conviction failed.